Cross Breeding can be used on flax, flowers (Sea Lilies, Roses) vines, and wheat in a greenhouse. The tech is received from a University of Thought. Look under Techs Cross Breeding to see which regions have opened Cross Breeding. Click on the Greenhouse to find the "Crossbreeding..." option. 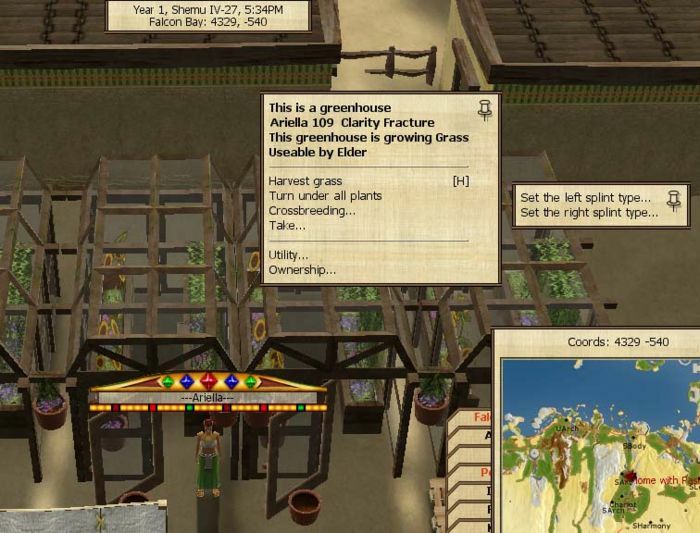 Note: With Tale 4 labeling of greenhouses was added under Utilities. It is 'highly' recommended to use this with some notation such as "#34 Fracture Energy" and record the cross on another page for later reference. You may place two differently named plants (see note later to get around this exclusion) of the same type and species, one in the left cross and one in the right cross. For example, a sea lily cannot be crossed with an orchid, and neither can two different seasonal wheat types be crossed. If there is a plant in the left or right cross already, you will get the message "The left/right splint is already satured with whatever. Scrape away these seed and replace with whatever?". This can be handy if you have forgotten which plants are in the left and right crosses, say after you have been using solvents. If you would like to breed the same named plants you may go to any University of Worship (after gaining the Seed Registry tech at a University of Leadership) and rename a plant variety. Make sure you have Nut's Essence in your Items, refresh the cross breeding window and click on "Initiate the Cross". A message in Main will tell you that it will take 15 minutes for the cross to finish. After 15 minutes another message will tell you that the cross is finished and which #number it is. The plants used in the splints will be consumed. One child bulb or seed will be formed by taking a certain number of genes from the left side of the genome of the Left Cross and grafting it on to a certain number of genes taken from the right side of the genome of the Right Cross. So if you understand what those genes and gene sets do in a genome you can make more intelligent crossbreeds for what your target is. Sometimes a gene is added or eliminated at the splice point. If a gene is added, it will always be a doubled gene just left or right of the splice point. Statistics (90 experiments) show an approximate chance of 25% to get an elongation and 25% to get a shortening. The genome length of the crossbred plant is by default the average length rounded up of the parents' genome. The rounding up on odd genome length sums is based on 20 tests that gave 10 results with rounded up average length, along with 3 results with 1 more gene (doubled gene at splice point) and 7 results with 1 less gene (eliminated gene at splice point). Giant and Giantx2: Fracture on Left Cross, any other flower on Right Cross. Approximately 1 in 6 chance. ROYG is the giant gene set. There are two sets of those on the left side of the Fracture genome (ROYGROYG)YORGORGOOO. Dwarf and Semidwarf: Any flower on Left Cross, Fracture on Right Cross. Approximately 1 in 6 chance. GYOR is the dwarf gene set. One ROYG giant set plus one GYOR dwarf set will make a semidwarf lily size. Fracture has ROYGYOR in its genome which is actually a ROYG giant set with a GYOR dwarf set merged into it. But because there is also another ROYG on the left side we need the child genome to leave out that far left ROYG giant set or cut off part. Low fertilizer lily: Energy Left Cross, Crown Right Cross or vice versa. The 'V' gene lessens fertilizations by two standard ferts each. Energy conveniently has 5 'V' genes on each end of its genome. So for a really low fert lily, try some of each of the above, check the ferting rate and then cross a first generation Energy/Crown on the Left Cross and a Crown/Energy on the Right Cross for a second generation child bulb. This page was last edited on 19 March 2019, at 03:08.